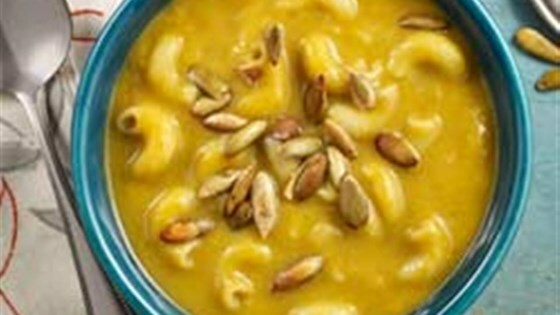 "This comforting, delicious gluten free pasta soup with squash is perfect for chilly days." In a large soup pot, saute apples with olive oil, onion, sage, nutmeg, cinnamon and cloves for 4-5 minutes or until slightly softened. Season with salt and pepper. Add milk, chicken broth and squash and bring the mixture to a simmer. Cook for approximately 15 minutes or until the squash is nice and soft. In a blender, puree the soup in small batches to achieve a nice, smooth consistency. When finished, transfer the soup back to the pot and bring it back to simmer. Season with salt and pepper. Add the uncooked pasta to the soup and continue to cook for half the amount of time suggested on the pasta package - while stirring frequently. Set the soup aside and let it rest for 25-30 minutes. In a small skillet, toast the pumpkin seeds over medium heat for approximately 5 minutes, or until they are slightly golden. Sprinkle the pumpkin seeds over each bowl before serving.